A private jet carrying rapper Post Malone blew two tires during takeoff at a small New Jersey airport on Tuesday but made a safe emergency landing hours later in upstate New York, prompting the rapper to thank fans who prayed for him. A private jet carrying rapper Post Malone blew two tires during takeoff at a small New Jersey airport on Tuesday but made a safe emergency landing hours later in upstate New York, prompting the rapper to thank fans who prayed for him and diss those who "wished death" on him while he was in the air. The face-tattooed singer/rapper, who had been headed to England, tweeted, "i landed guys." "Oh, my God, I hate flying in general. I don't even know what to say, man. I'm shook," he told the celebrity website TMZ on Facetime. "There was one hell of a team on that aircraft, and we're here, we're here on earth, and I need a beer, and I need some wine, at the same time, mixed together." The troubled Gulfstream IV was en route from Teterboro to London Luton Airport in Luton, England, when the pilot realized shortly after takeoff that the tires had blown. The pilot began circling the airport for about 30 minutes before the jet was diverted. The plane originally was to attempt an emergency landing at Westfield-Barnes Regional Airport in Massachusetts, airport manager Eric Billowitz said. A small group of the curious and fans who had heard Post Malone was on the plane gathered at the airport in Westfield, Massachusetts, hoping to watch the landing. "We came down because he had the biggest day of his life yesterday and we wanted to make sure he is safe," said Jessica Kielb, of Chicopee, Mass. 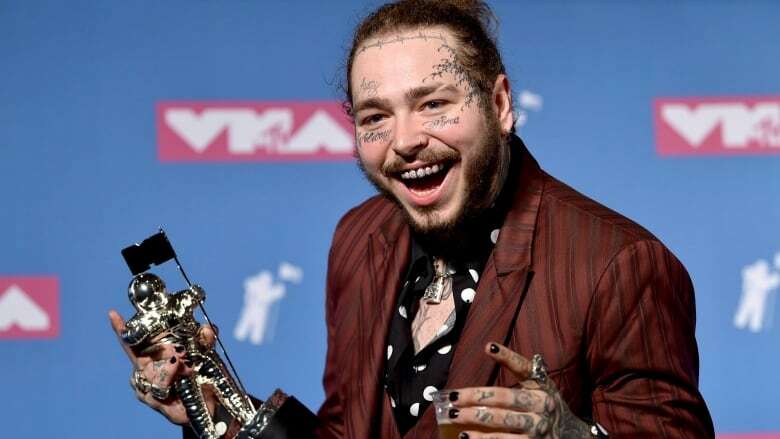 Post Malone took home the song of the year award at the MTV Video Music Awards on Monday night in New York for his hit Rockstar, featuring 21 Savage. The song is from his latest album, Beerbongs & Bentleys. The 23-year-old was joined on stage by rockers Aerosmith and 21 Savage for a wild performance that closed out the awards show. Billowitz said he was told the plane was first headed to the Massachusetts airport because there is a Gulfstream service centre there and because the airport has "one of the longest runways in the Northeast" at 2,740 metres, but the plane was then diverted to Stewart. Stewart's signature feature is a nearly 3,650-metre runway, long enough to handle the fat-bodied C-5A Galaxy planes laden with supplies and better for such emergencies. The plane had 16 people on board when it left Teterboro Airport around 10:50 a.m. Tuesday, the Federal Aviation Administration said, but didn't specify if the number of people aboard included the pilot.